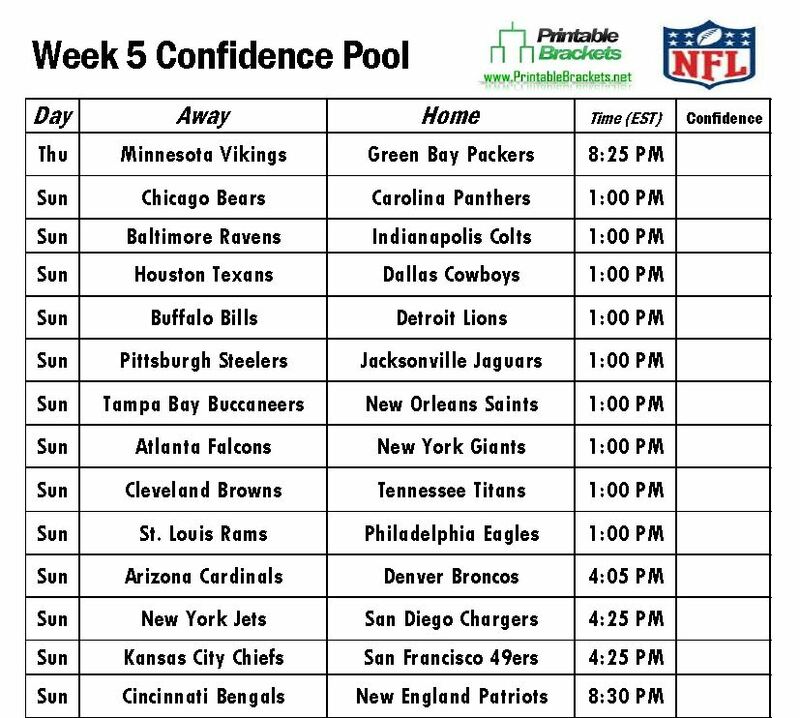 The first game on the NFL Confidence Pool Week 5 sheet features the Green Bay Packers hosting the Minnesota Vikings on “Thursday Night Football.” In addition to the battle of rebuilding clubs, several division rivals will renew pleasantries in Week 5. You can run an office pool or follow all the action with the NFL Confidence Pool Week 5 sheet. The NFL Confidence Pool Week 5 sheet is instantly downloadable and printable, as is the Week 5 Pick Em sheet. Both are absolutely free from PrintableBrackets.net. The Packers enter the 2014 NFL season as the defending NFC North champions. Green Bay went on a late-season run to capture the division crown, but suffered a loss to the San Francisco 49ers in the opening round of the playoffs. In the opener of last year’s season series, the Packers notched a 44-31 win in Minnesota in Week 8. However, the teams played to a 26-26 tie in Green Bay in Week 12. In early Sunday action on the NFL Confidence Pool Week 5 sheet, the Dallas Cowboys will host the Houston Texans. NFC South foes will face off when the Tampa Bay Buccaneers battle Drew Brees and the New Orleans Saints at the Superdome. In the late games on the NFL Confidence Pool Week 5 sheet, Peyton Manning and the Denver Broncos will host the Arizona Cardinals. Alex Smith will make his return to San Francisco when the Kansas City Chiefs clash with the 49ers. Two teams will enjoy their bye weekend in Week 5: The Oakland Raiders and the Miami Dolphins.